This is not a traditional Goan recipe. 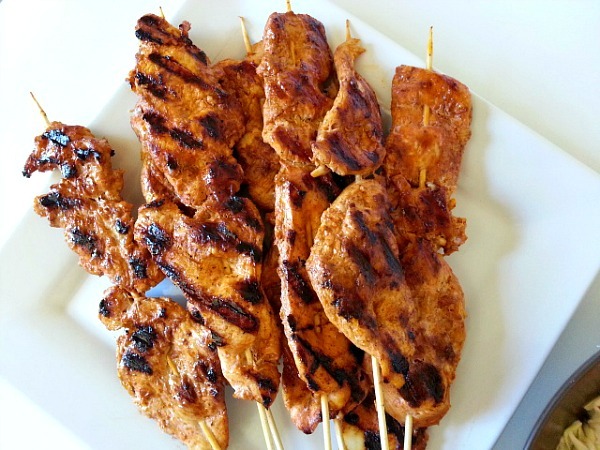 After I tested this recipe I thought of checking Google to see how many recipes I could find for Vindaloo Chicken Skewers and I was surprised to find not too many yay! This blog post has 2 recipes today the second being the famous Goan salad that I grew up eating. The dressing was always the same we never had seen any other salad dressings till I came to the US. 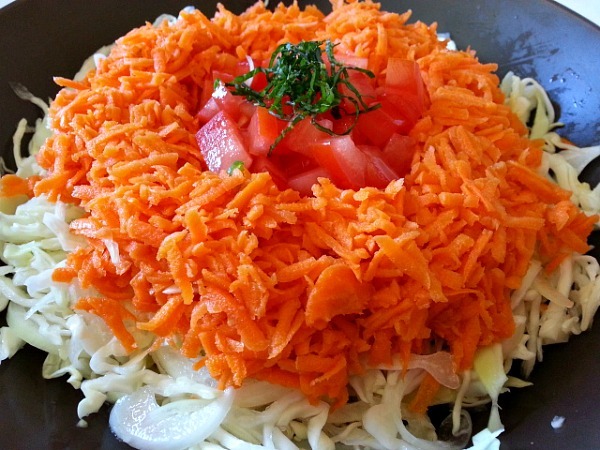 The basic salad is made with cabbage, carrots, onions. tomatoes, vinegar and oil is an option. I skipped the olive oil as I wanted to cut the calories. Sometimes simplicity just cannot be beat. So I would challenge you to try this very simplistic recipe at-least for once’s :-). 1) If you want your meats to be well-flavored then my HUMBLE advice is to marinate the meat over-nite. 2) Refrigerate the meat in an air-tight glass container like a Pyrex, as it can stain plastic tupperware and it has a strong smell of the vinegar, ginger-garlic paste. 3) Soak the skewers in water for a couple of hours so that they do not get burnt specially if you are using a fire grill. Wash the meat and butterfly the breast, place the meat between parchment paper and lightly tenderize the meat. Cut them into 4 strip each. 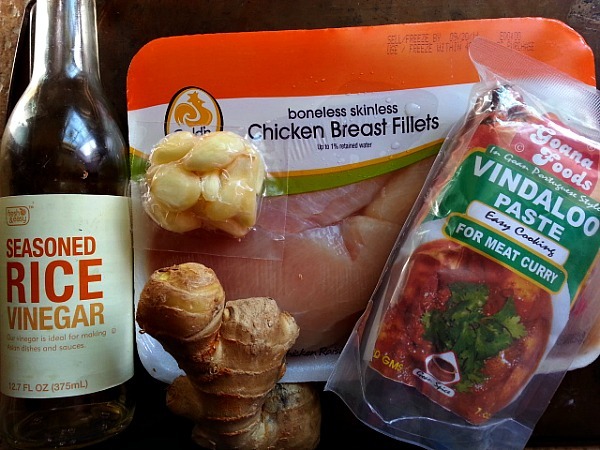 Mix the vindaloo paste, sugar, vinegar, ginger-garlic paste to form a marinade. Season the chicken with salt, apply the marinade and store it in the refrigerator overnight in a air tight glass container. Heat the grill either wood, gas or electric. Skewer the meat about 8 skewers in total. Brush it with some oil and grill the skewers for 4-5 minutes on each side. I like my meats well done. If you like it just done then for 2-3 minutes on each side. 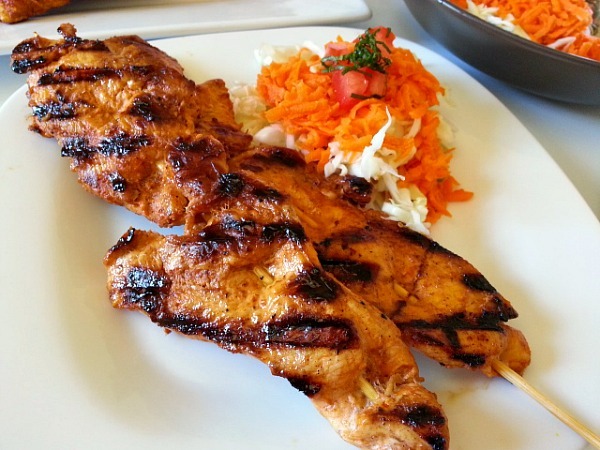 Serve as a side with rice or with a nice Goan salad. 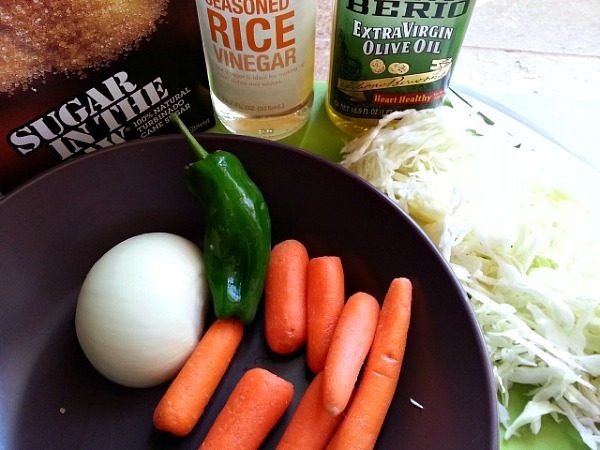 In a mixing bowl add vinegar, sugar, diced jalapeno, salt and whisk it. Mix the cabbage and sliced onions together and pour about 3/4 the amount of dressing and mix it well. Pour the rest of dressing into the grated carrots. On a serving plate lay the cabbage first. Next lay the carrots. Decorate with chopped tomatoes and cilantro. What spices are in the curry paste? I’d like to try to make it at home if I have the supplies. Noemie, Thank you sooo much for your award and for such kind words, I am really touched. I am happy to know I was your first follower :-). Wishing you much success. What a super idea! 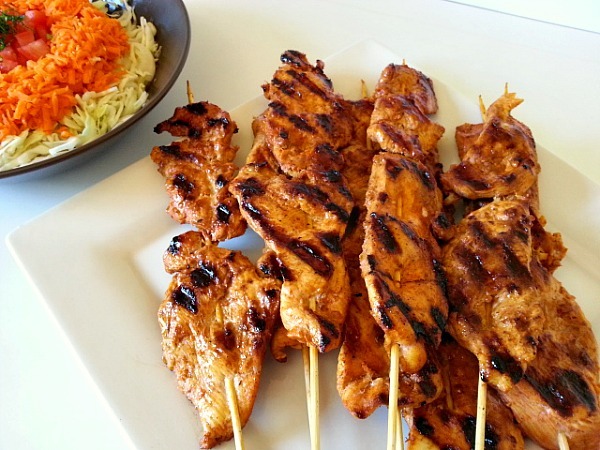 Vindaloo skewers!! Can’t wait to try these. The salad looks amazing. Can’t wait to try that. I don’t eat meat but know my family would love the chicken, an looks so simple to make which is always good for busy mums like me. Best of all it’s healthy. 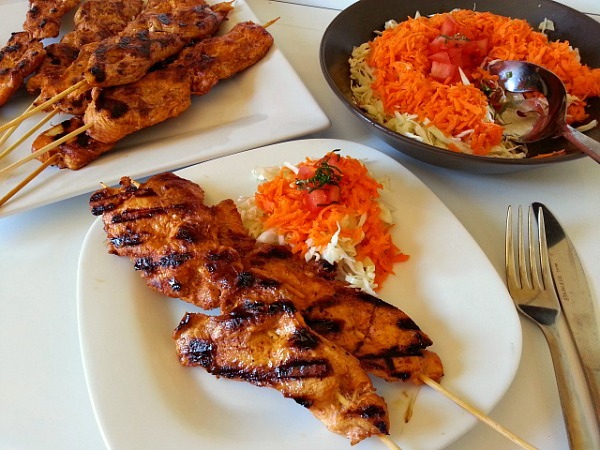 I really like the pairing of the skewers with something lighter, like a salad. For people who can’t tolerate very spicy food, is there a milder vindaloo you would recommend? Thank you for your kind words :-). The only option I can think of without losing much of the flavor is to thin out the curry paste with vinegar, ginger-garlic paste and some ketchup. Which I have done in the past a couple of times. Hope this helps. This looks yummy, definitely going to try it! Great blog! That chicken looks cooked to perfection! This salad will be terrific for alot of my clients – thanks for the post! Can’t wait to try the chicken. Great Nandini, you were able to transform that dish pretty well. I don’t think I’ve heard of that Goan salad? It sure sounds good, perhaps I have tried it, and forgot about it? Will definitely give it a go. It’s not easy to make that transition when you get older. My parent too have cut down on spices totally even though they grew up eating it. Love both the dishes! I have never had the Goan salad. will definitely make it! Oh my Nandini, this sounds so good. I can see using pork as well. Wonderful! Have a great weekend! Cheryl. Thank you Cheryl, that is kind of you 🙂 It will work with any meat, tofu or seafood. You too have a great weekend. Thank you so much! It tasted really good :-). If you like spicy foods then I think you may like vindaloo.